According to Erik Anderson, Nokia's Senior Vice-President of Business Applications, the idea for coloured phones came from a seedy bar called Rikala in Salo, Finland; it was the Friday night haunt of Nokia engineers. The engineers put their far from pocket sized Nokia bricks down on the bar and after a night's heavy drinking, they could not figure out whose phone was whose. So they painted their phones in different colours. From the early days, Nokia's design consultant and later chief designer, Frank Nuovo realised that there was a market for phones in different shapes and colours for different market segments. Nokia started experimenting with different coloured designs with their popular analogue phone, the Nokia 101, in 1992. The Nokia 101 also formed the basis for the Swatch Cellular phone, which was probably the first fashion phone. Coloured phones never really took off in the early days. Most people opted for black or grey. The phone needed to go with them everywhere and larger phones were much more visible. Taking out a bright red brick in a board meeting may not have looked too cool. However, in the mid 90s a market for replacement covers for mobile phones started to emerge. You could change the look of your grey phone to burr walnut, gold, or red, or anything you liked, provided you were happy to prise it apart and invalidate the warranty. Nokia decided to do this officially. The Nokia 5110 from 1998 was Nokia's first phone with interchangeable fascias. The 5110 started two new market segments for Nokia, the fashion and expression segments. Expression segment phones would offer customisability in interchangeable fascias and a selection of ring tones. Fashion phones would sit above Expression phones and offer customisability, more advanced features and cutting edge style. The 5110 was really the beginning of the Expression segment, but Nokia sponsored UK Fashion Week and offered 5110s as competition prizes and the 5110 won the Guardian 'Off the Cuff' Accessory of the Year Award in 1999. The following year Nokia launched two new phones. The 3210 was smaller than the 5110 and had a built in aerial, but was still a fairly chunky phone by modern standards. This phone launched the Expression series as a distinct segment. It was significantly better than the bargain basement black and grey phones that were being sold in the supermarkets with PAYG, but still left room for a more upmarket phone to top Nokia's consumer range. That phone, smaller and lighter than any Nokia to date, was instantly desirable and created a new market. The fashion category was about a particular type of person: the one that always jumps on new fads before anyone else and always dresses on trend. This customer wants a phone that is stylish and cool; a phone his or her friends will be impressed with. They will want the technology that makes their phone the best available, but not too geeky. It is as much about image as hi-tech. These phones had a certain edgy coolness, like a pair of fashionable jeans, there was something about them which might make the older generation disapprove. Style always costs and these young 20 or 30 something consumers were happy to pay with an expensive contract that would be seen as a waste of money to their older friends and relatives. The designs had to be spot on and Frank Nuovo and his team were very adept at creating the look. The timing also had to be perfect and the market had to exist in sufficient numbers. The Swatch Cellular Phone, back in 1992, was too early as customers could barely afford a basic phone back then. If Nokia went into this market too late, they would have missed the boat. Sony Ericsson came to the party too late in 2001. Their T68m was a fashion phone offering a colour screen and the promise of picture messaging. It made an impression at the time, but Nokia was too firmly established. Nokia's timing with the launch of the first true fashion phone, the Nokia 8210, was perfect. They had successfully launched a premium phone, the 8810 the previous year aimed at top executives. Nokia's marketing brains decided that a segment now existed for a premium consumer phone. Like the large 3210, the 8210 offered interchangeable fascias, but the phone was much smaller, lighter and more stylish. You can use one of these today and it still feels good, provided you can forgive the black and white display. Unlike later fashion phones, the 8210 is also very usable, the keys are nicely shaped and in the right places. Fashion could not stand still and Nokia designers developed the fashion category with a range of phones, each with a new design and more features than its predecessor. The 8310 had an FM radio and different interchangeable covers: the front, the back and middle could be customised. The 7210 had a colour screen and a new stylish case and a new keyboard. The 7250 added a camera and yet another new keypad. The model numbers were a little bit confusing. 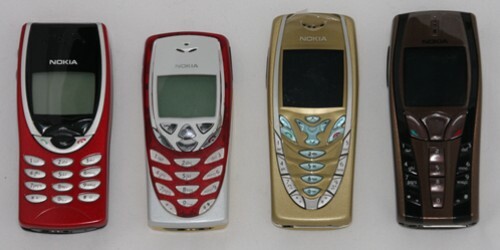 The first fashion phones were 8000 series phones: the 8210 and 8310. However, after that fashion phones used 7000 series numbers: 7210, 7250 and the 7260, 7270 and 7280. Starting from the 7210, style started to take over from usability as the driving factor. The phones started to look like change for change's sake and keyboards became more and more weird and less easy to use. The 7260, 7270 and 7280 took fashion to the extreme. These phones in a luxurious piano black were targeted mainly at female consumers. The were inspired by the Art Deco era. The 7280, known as the 'lipstick' phone, did not have a keypad. In the end Nokia took the concept too far. Fashion phones became difficult to use and styling upgrades replaced innovation. Even before Apple launched the game changing iPhone, Nokia seemed to have lost its way. 1. The Phone Guy; How Nokia designed what may be the best-selling cellular products on earth; by Michael Specter; published in The New Yorker, 26 November 2001.